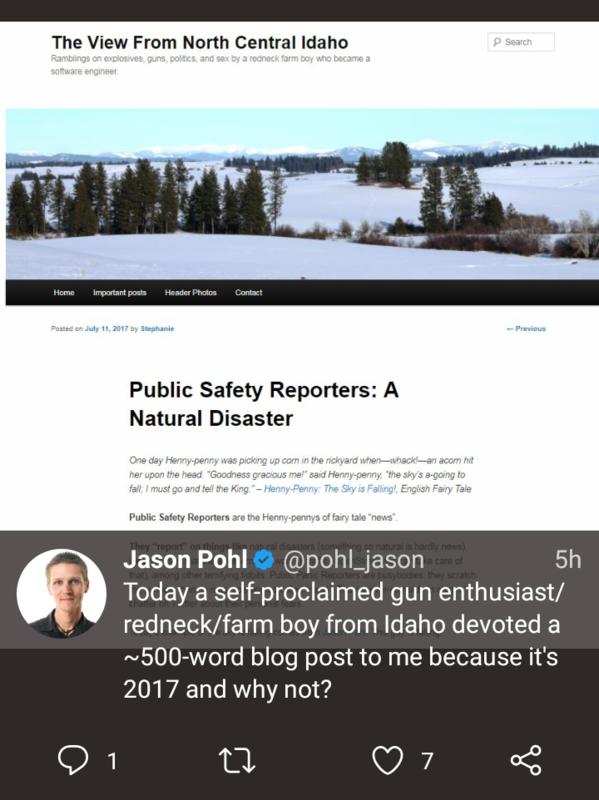 This entry was posted in This is what they think of you and tagged @pohl_jason, Arizona Republic, Coloradoan, fake news, GunCog, Jason Pohl by Stephanie. Bookmark the permalink. It is not terribly difficult to get off your shtick, take a few steps back, and try to be objective. Total objectivity may not be attainable, being that our emotions often get the better of us, but one can certainly seek it. Mainly, that seeking involves sitting still and then watching and listening. Politely disagree. When doing so would utterly annihilate your world-view, it is well-neigh impossible to do so. When the subconscious recognizes the danger, it doesn’t let you admit wrong-think internally, so it must lash out and attack the irritant. Leaning or admitting mistakes is virtually impossible. Amusing that he finds a 500 word blog post to be a significant form of devotion. It’s shouldn’t be a surprise given how active he is on Twitter, but still. No he can’t do better because he doesn’t want to. It is more fun to hate the enemy. Plus like most reporters he is probably stupid, ignorant, and lazy to boot. Funny how people in a profession that it is utterly dependent on their credibility are so eager to toss that aside for cheap political points or their ideology. Jason Pohl does not impress me with his devotion to seeking the truth. He rates a zero on the informed and credible scale. Fake news. Pravda propaganda (too bad he is too young and ignorant to know what that means). This is how you got Trump; and will continue to get Trump.